I’ve been looking forward to this since last year. It’s ASHEVILLE BEER WEEK! Asheville is Mecca for beer lovers, Beer City USA, and my favorite city to visit. Last year I was an official guest blogger for ABW, but this year the official blogging is being done by my friends over at Asheville Ale Trail. I am simply here to enjoy. I got into town around 6pm on Friday evening. My original plan was to head over and see friends at Urban Orchard but on the way into town I received a text from a friend informing me that there was a Green Man meet the brewer event and tasting at Appalachian Vintner. Since App Vintner is always on my itinerary, I opted to go there first. I arrived and settled up to the bar where I was greeted by Charles. I placed an order. I thought it appropriate that my first official beer of Asheville Beer Week would be the Asheville Brewers Alliance White IPA. 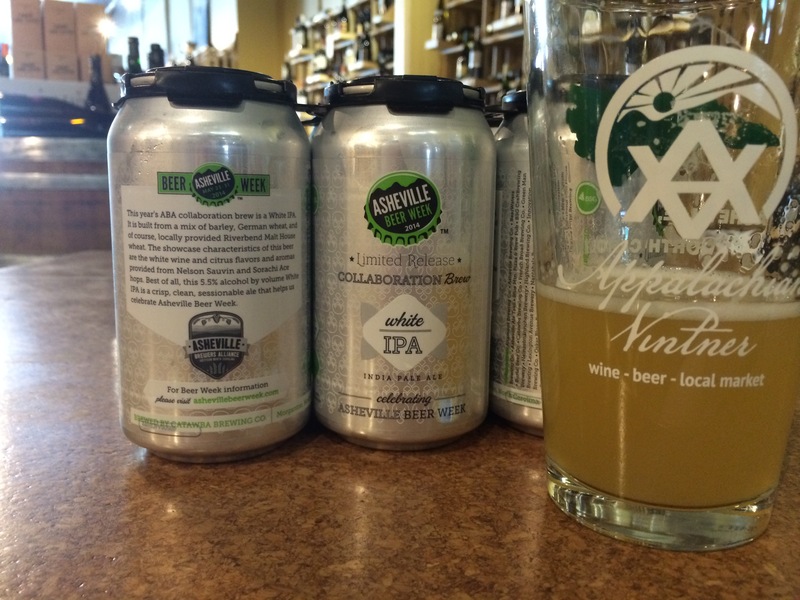 This cloudy, hoppy and tasty beer is a perfect representation of the style, and of Asheville. My first beer of Asheville Beer Week. After I finished it, I ordered Green Man’s Berliner Weisse. I walked over and spoke with Green Man’s brewer to ask if this was the previously bottled Shadenfreude, but he informed me it was not. 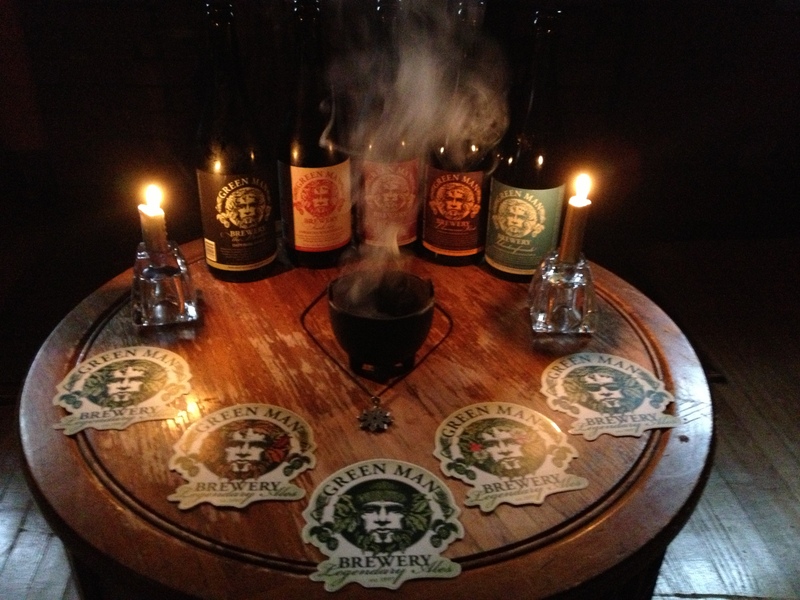 I told him of my love of Green Man’s beers and showed him a picture I keep on my phone of when I had bottles of all the small batch stuff. After talking some more, it was time for some bottle shopping. I walked around and carefully chose a small selection. This trip is being done on a shoestring budget, so more times then not, I kept having to put back bottles of stuff I wanted. As I sipped and shopped, Charles came over to inform me that he had just tapped a keg of Olde Hickory’s 2013 Event Horizon. How could I resist? This beer is better as it warms, so I cupped my half pour tightly in my hands to lend it some of my body heat. While I was shopping, I noticed on Untappd that other Knoxvillian friends of mine were in town. I paid for my beers and headed to try to catch up with them. As I drove downtown, I saw Julie from Bruisin’ Ales on the front patio of Thirsty Monk. I parked and walked over there. Jason from Bruisin‘ was on the front patio and after we said our hellos, I walked to the bar where I saw my favorite Asheville bartender, Clete. Sitting at the bar was Julie and Jason came in to join us. I had a pour of Stone’s Sprocketbier while we chatted. I wanted to hit up Wicked Weed, so I said goodbye and walked over. When I arrived, there was a line to get in. At this point I was hungry so I headed over to Coxe Avenue to get a slice of pizza (and more beer) at Asheville Brewing Company. I settled up to the bar and ordered. After awhile I got a text from my friend Jerry that himself, Millie, Robert and Brittney were over at Barley’s and I should join them. Right when I was leaving, an incredibly gorgeous girl stopped me outside the door. “Are you Ratchet?” Caught off guard I stammered, “uh, yeah.” “Oh hey, I read your blog, you in town for beer week?” We talked for a bit while my phone kept getting text from Jerry asking were I was. I didn’t want to be rude to my friends, so I invited her to join me, but she was in the same position with her friends waiting inside at Asheville Brewing Company. We talked about getting together at some events and said goodbye. I stupidly forgot to get her number. So if you are reading this, email me and let’s hang out at Westside Fest, ok? Catching up with my buddies at Barley’s we had a drink and made plans where to go next. We agreed that Thirsty Monk would be a good choice, especially since Robert said he hadn’t been there before. We walked over, bought a round upstairs and then headed downstairs for another. The group wanted to go to Asheville Brewing Company, and I was with it, but convinced them to go across the street to my favorite dive bar, the Asheville Yacht Club. I love that place! It’s small, rough, rowdy and has good drinks. I have some great memories associated with it. We ordered some more beer. Our crew was a little disorganized and wanted to go over to Jack of The Woods, but a quick check showed there was a cover charge, so we passed and settled back to our drinks at Yacht Club. It was getting late and I still had to make my way to my friend Wes’s house in South Asheville. I said goodnight and parted ways with the rest of the crew as they headed for Asheville Brewing Company. I got to Wes’s house and we hung out a bit and tried a few brews. I was tired and knew that today would be huge, so I called it a night. Today’s agenda is fun. Wes is a great homebrewer and is pouring his beer at Just Economic’s Just Brew It homebrew festival. I am helping at his booth, Midnight Oil brewing. I’m really looking foward to seeing all my Asheville friends. The last 2 years the locals have told me that this event is their favorite part of beer week. Before this I’m going over to Hi-wire Brewing’s Ringmaster Release and Belgian Waffle Brunch. I’m trying to hurry up and write this so I can go. Tonight after Just Brew It, a group of us are going over the Catawba’s Asheville location for the King Coconut release party. Well I need to get out the door and get to it. I’ll be live posting today’s festivities on Twitter, Instagram and Untappd. I’ll try to write again tomorrow. Check out the pictures below. I’m a card carrying member of Yacht club! Let’s get serious for a minute. Breakfast of beer drinking champions. My First Beer of Asheville Beer Week! This entry was posted on Saturday, May 24th, 2014 at 10:33 and is filed under #AvlBeer, #NCbeer, Appalachian Vintner, Asheville, Asheville Beer Week, Asheville beercation, Asheville Brewing Company, Beer Festival, beer travel, beercation, Bruisin Ales, Maryville beer blogger, Thirsty monk. You can follow any responses to this entry through the RSS 2.0 feed. You can leave a response, or trackback from your own site.